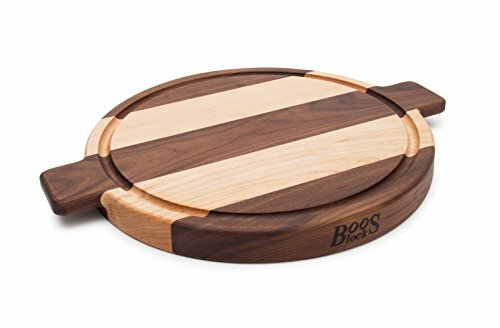 With classic John Boos quality construction and a modern wide stripe design, the Master Class cutting board by John Boos is in a class by itself. The board is round, with a 15.5 inch diameter and stands 1.5 inches tall. It features sleek edge grain construction with carefully selected hard rock maple and black walnut wood interspersed in wide stripes. The result is an eye-catching board great for heavy duty tasks like chopping, slicing, carving and cutting -or- as a serving board for meats, appetizers, cheeses and more. The Master Class cutting board is reversible: one side features a deep juice groove/juice well to collect juices while carving, the reverse side is completely flat. Two integrated handles make lifting, moving and maneuvering this cutting board a breeze. It is finished with Boos block cream and beeswax and is not intended for use in the dishwasher. For best results, John Boos recommends oiling this finely crafted board often with John Boos Mystery Oil or Boos block cream (sold separately on Amazon). This board should be hand washed and is not intended for dishwasher use. John Boos and company has been producing wooden butcher blocks in Effingham, Illinois since 1887. Today, John Boos boards and blocks are used and loved in commercial and home kitchens worldwide. Often imitated, John Boos is known for beautiful, high-quality pieces. All John Boos cutting boards and butcher blocks are still proudly made in Effingham, Illinois by skilled craftspeople.